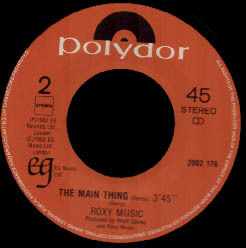 Lyrics to the song The Main Thing as recorded by Roxy Music. The Main Thing from Roxy Music's 1982 album Avalon, opened their 1982 and 2011 tours. It was played in USA in the early part of Bryan Ferry's Mamouna tour in 1994 but was dropped after a few shows. There is a re-mixed version which was used as the b-side to Take A Chance With Me. A 7:43 Dance version was mixed for the b-side to the Take A Chance With Me 12". A remix by Malcolm Green & Tom Hodge was used in an advertising campiagn for the Vauxhall/Opel Vectra in 2005.